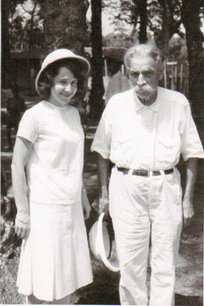 Christiane with her grandfather, Albert Schweitzer. *Christiane Engel grew up in Switzerland, where she began piano lessons at the age of six with Annette Ganz. At the age of sixteen she entered the Conservatory of Zurich, Switzerland, studying the piano and the organ with Erich Vollenwyder. In addition to studying psychology, social anthropology and medicine, attaining a Ph.D. and a license in medicine, she has continued her piano studies with master teachers Irma Schaichet, Joanna Graudan and Vitaly Margulis. She has worked as a medical doctor, and she has concertized in the Czech Republic, Switzerland, France, Austria, Germany, Poland, Holland, the United States, Korea, Norway, Taiwan and Japan. For the most part she gives concerts for charitable causes. 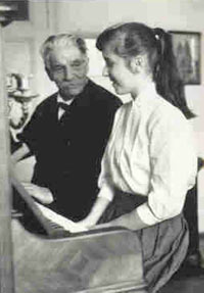 In her youth, Christiane spent many unforgettable months with her grandfather, Albert Schweitzer, in Europe and Africa. Her grandfather was a treasure of profound importance and inspiration to her. Christiane currently lives in Los Angeles, USA. She is married to Steven Engel and is the mother of three daughters. *Honorary member of the Stern Orchestra Prague, the Stern Quartet Prague and the Bohemia Symphony Orchestra. *She is also Board of Director at the Albert Schweitzer Hospital of Lambarene. “My love for Mozart’s music started in my early childhood. I still clearly remember, when at the age of six, I first heard Mozart’s A Little Night Music. The melodies did not leave my mind. They thoroughly and wonderfully overwhelmed me. Later I realized why I was so deeply moved by Mozart’s music; it reflects my ideals of harmony, peace, love, compassion and human understanding and it embraces optimism, hope and a belief in a higher truth and divine spirit.